1) Turn knob of jet cleaner until 'V' is pointing downwards. 2) Unscrew the filler cap and ensure there is sufficient paraffin in the tank, approx. half full, replace filler cap.. Check air screw on the filler cap is loosened. 3) Should you be re-lighting the lamp and know there is sufficient paraffin in the tank, always loosen the air screw on the filler cap to release any pressure. 7) LEAVE THE LAMP ALONE ! !, don't fiddle!, when the methylated spirit is amost used up tighten the air screw and give three to five full strokes on the pump. The mantle should light with a gentle 'Pop' and give a slightly yellow light. 8) Allow to burn for 30 seconds or so then give several strokes on the pump, (up to 40), until the mantle is burning bright white and the lantern gives a steady hiss. Over-pumping will cause yellow flame outside the mantle and can damage the tank. If the light begins to fade or the mantle 'pulses' light give additional strokes of the pump to restore brightness. To extinguish the lamp simply release pressure with the air screw. Do not turn off by using the jet cleaner knob. Should the jet become blocked or the lamp suddenly drops in brightness quickly turn the jet cleaner knob half way round and back again to operate the cleaning needle. Have a match or lighter handy should the lamp go out and relight immediately. Fitting new mantle. Access the mantle by loosening the handle securing nuts and lifting off the enamelled hood. Ensure all of the old mantle is removed, especially any 'string' in the groove around the brass burner body. Fit the new mantle by sliding the larger opening over the spigot and stretch it into the groove around the burner body. Then slide the smaller end to the bottom of the spigot. Arrange the fabric of the mantle evenly around the burner to ensure correct shape when the mantle is burnt. 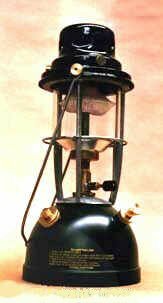 Replace enamelled hood back on the lantern ensuring the vapouriser tube passes up into the centre of the spigot. When the spirit torch is applied for the first time after fitting, the new mantle will burn and smoke. This is normal, after burning the mantle will have the property of white ash and is very fragile, DO NOT TOUCH! With practice it will take less time to light your lamp than read these instructions!.